The number of refugees living in towns and cities has greatly increased since the UN Refugee Agency (UNHCR) released its urban refugee policy in 2009. The agency should reflect on its role in urban settings, and provide practical guidance to its country offices on engaging with municipal authorities. This should be based on improved evidence and recognition of how urban refugees navigate formal and informal systems to meet their basic needs. This type of evidence is critical to refining targeting and establishing resource requirements. As new IIED research shows, refugee organizations themselves can generate data that provide more nuanced understanding of urban poverty; the process can help them develop stronger networks and thus contribute more effectively to local democracy. Equally important is understanding the needs of local authorities responding to displacement, and incentives that drive a positive response. 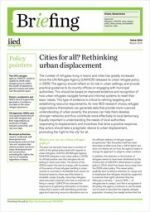 Key actors should take a pragmatic stance to urban displacement, promoting the “right to the city” for all.